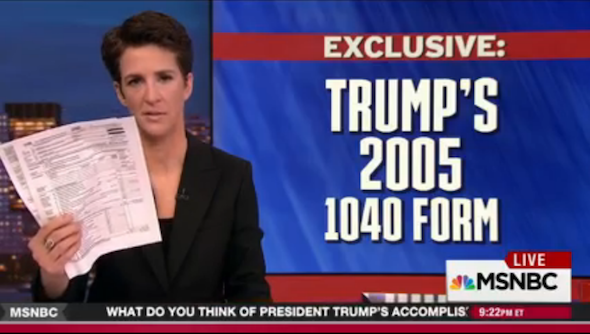 Rachel Maddow's Trump taxes scoop was a cynical, self-defeating spectacle. Rachel Maddow had the goods, but she oversold them. Trump’s tax returns, whatever information they happen to contain, constitute a major scoop. Maddow’s social media team ensured the highest possible ratings for that scoop. But if ever a story should have been delivered in a stentorian, fuddy-duddy, nonpartisan manner, this was it. In positioning it as a grand revelation, a vital step in comprehending Trump’s corruption, MSNBC created an exceedingly cynical spectacle. By playing into the network’s loyal liberal audience’s fantasy that there exists a Trump silver bullet, it instead delivered Trump a positive news cycle—the guy pays taxes! Who knew!—amidst the debacle of the American Health Care Act, along with more evidence that the media is aligned against him. The lesson? Don’t tell us you have news, just tell us the news.